Greenery is so 2017. Say hello to Ultra Violet. Every year since 1990, the Pantone Color Institute, a consulting service within Pantone, has nominated a Color of the Year, forecasting which specific hue designers and consumers will all be using, wearing, and buying for the following 12 months. 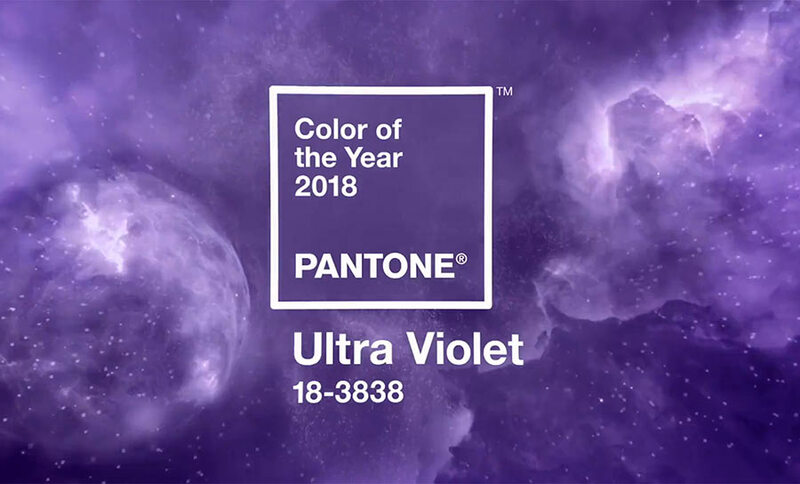 In case you hadn’t heard, Pantone has selected 18-3838, or better known as Ultra Violet as the official color of 2018. Pantone explains that Ultra Violet is a dramatically provocative and thoughtful purple shade, communicating originality, ingenuity, and visionary thinking that points us toward the future. Start Small: Add accents and infuse your space with Ultra Violet. Whether its artwork, lamps, side, table, throw pillows, a few lavender candles, flowers, or simple violet vases, you can easily incorporate this blue-based purple. Small pops of purple decor can really bring an interior to life. Fresh Flowers: Bouquets can be easily created using these colors. Purple blooms can symbolize so many things. Rich, dark plum and mulberry shades give the feeling of refinement and luxury. Light lavenders and mauves lend a flirty air. Lilac-violet-amethyst family mixes adds instant whimsy. Explore these purple flowers. Living Area: This color may be perfect for your living room if you want to attain a sophisticated ambiance in the living room. Swap out your sofa in a softer shade of purple or add an accent chair. Add a dab of purple with a geometric-print throw pillows. Throw a rug with an oversized print to the mix, it will add a whimsical touch to your space. Done right, purple can be a distinguishing color in your Signature space. The options are limitless. Bedrooms: Ultra Violet can be the ideal color to use in bedrooms or other settings where a calm, serene effect is sought. Ultra Violet with a hint of softer purples evokes a soothing, tranquil feeling, which is ideal for any space where you want a calming ambience. Create a clean, balanced look in the bedroom by adding a new comforter in this shade, and pair it with neutrals like off-white or cool gray. Kitchen: Pairing ultra violet and deep charcoal gray will give your kitchen a completely royal vibe. Pull your look together with pops of color around the room by adding barstools, rugs, appliances, fresh flowers and other accessories in of variations of this shade. Office: Being aware of purple’s emotional and motivational power, we would ask you: why not using purple tones in your office? Add a bit of lively color with office supplies in purple tones, an accent wall, office chair, or wall clock. “Nuanced and full of emotion, the depth of PANTONE 18-3838 Ultra Violet symbolizes experimentation and non-conformity, spurring individuals to imagine their unique mark on the world, and push boundaries through creative outlets.” – Pantone. Get creative with this beautiful color that’s sure to find its way into your home and heart as your new color crush this year. How will you integrate this new hue into your Signature home?